Your resource for mailbox, shipping, and printing services in Georgetown, TX. Three blocks west of the former location. Between Texell Credit Union and Village Cleaners. You can count on the printing professionals at The UPS Store Georgetown to help you make a lasting impression. We offer a wide range of printing and copying services to help you promote your small business or prepare for your personal event or presentation. Place your order online or stop by our store to get started. The UPS Store is your professional packing and shipping resource in Georgetown. We offer a range of domestic, international and freight shipping services as well as custom shipping boxes, moving boxes and packing supplies. The UPS Store Certified Packing Experts at 723 West University Ave are here to help you ship with confidence. When you open a mailbox at The UPS Store, you get a lot more than just a box with a key. You'll get package acceptance from all shipping carriers, mail receipt notifications, and a real street address in 78626, not just a PO Box #. Apply today. Looking for a notary public in 78626? The UPS Store at 723 West University Ave offers convenient notary services near you. Stop by today to get your documents notarized and check another item off your to-do list. The UPS Store offers convenient and affordable document shredding services in Georgetown, TX, provided by Iron Mountain®. Shred your items to help protect yourself and your business from identity theft. Traveling abroad? Need to renew your passport? Stop by today to get your passport photo taken at The UPS Store location on 723 West University Ave.
Get easier checkout and flexible billing for your small business. Learn about opening a house account at The UPS Store on 723 West University Ave. The UPS Store of Georgetown is proud to be locally owned and operated. We are here to help individuals and small businesses by offering a wide range of products and services. At the UPS Store of Georgetown, we care about our customers and our community. That's why we work with local organizations, such as the Georgetown Chamber of Commerce, the Blue Santa Program of Georgetown, and the Brown Santa program of Williamson County, to give back to the place we live. We're Paul Erchinger and Joanna Pickar, and we're proud to serve the people of Georgetown, Texas. The UPS Store in Georgetown, TX is here to help individuals and small businesses by offering a wide range of products and services. We are locally owned and operated and conveniently located at 723 West University Ave. While we're your local packing and shipping experts, we do much more. The UPS Store is your local print shop in 78626, providing professional printing services to market your small business or to help you complete your personal project or presentation. We offer secure mailbox and package acceptance services, document shredding, office and mailing supplies, faxing, scanning and more. Everything for your small business, even shipping. We've got you covered. 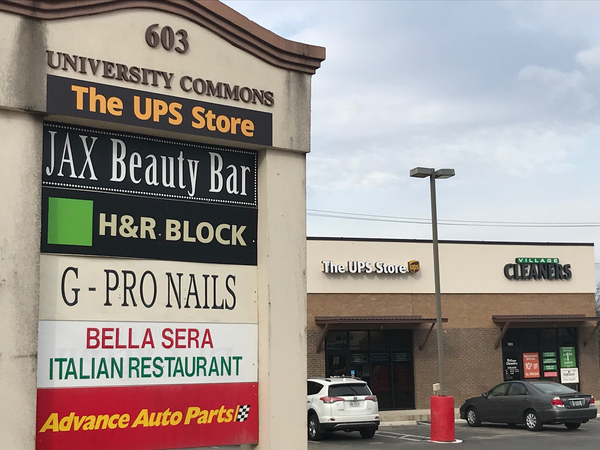 The UPS Store University Commons in Georgetown, TX offers the following products and services. The staff always greets me - a couple even know my name. They are always friendly and helpful! Thanks for the review Jane! Any feedback we receive is always helpful. We try to get to know our customers the best we can. We hope to see you again soon! I appreciate the staff that works at this location. They know me and I get prompt service. I am handicapped and I get assistance with packages to my car.. My only complaint would be directed to the building owner. Only the Cleaners have put out step stones for those of us that cannot step up from the parking lot to the building foundation. This is a code violation. If your business put a few step bricks like the cleaners, it would be greatly appreciated. Thanks for the review Laurie! We appreciate your review and the feedback. We are happy to know you are satisfied with our service. The landlord is aware of the step height issue and we can look into getting our own steps. We hope to see you again soon! Thank you for the review Rachel! We love to hear when we are getting it right! We hope to see you again soon! Thanks for the review Mr. Hoenig! We value you and your feedback. We will see you soon! Thanks for the review Marcia! We are glad to hear you have had a good experience with us. Hopefully we will see you in the store soon! Thanks for the review Tim! We appreciate you and like to know when we do a great job! We will see you soon! The staff is fantastic, friendly, and I genuinely appreciate and value how knowledgeable the store manager Joanna is. There has never been a problem she hasn’t been able to solve, no matter how complex the issue at hand is. It is beyond evident that her personality along with having completed high education are contributing factors in this stores succcess, as her associates clearly follow by her example. I hope she is getting compensated properly for her level of professionalism and expertise she portrays consistently across the board. Aside from that, the store is always clean. It is a little odd to not have a mirror in the bathroom but that’s about the only negative thing that comes to mind, and it is relatively minor. All in all, the manager makes this store, and I would wait in line for 2 hours to be serviced at this location vs any other location or carrier. Thank you for the review Chrysta! We appreciate your kind words and feedback on your experience. We hope to see you again soon! The staff is always friendly and extremely helpful!! Thank you for the review Melissa! We are glad to know you had a good experience at the store. We hope to see you again soon! Great staff and great customer service, i always feel like family when i walk in. Very great establishment! Thank you for your review Brandon! We always strive to treat you and all our customers thoughtfully. We hope to see you again soon! Thank you for your review Coby! We value your feedback and look forward to seeing you in the store again soon!